Alfred John Adolph went to be with his savior peacefully at his home on January 9, 2019. Alfred was born April 26, 1924 at Roundup, Montana to John and Martha Adolph. Alfred grew up north of Roundup where his love of horses and tremendous work ethic was first cultivated. Alfred worked on different ranches before being drafted into the army in 1944. He took his basic training at Camp Robinson in Little Rock, Arkansas. He was stationed in Germany at the end of WWII as an MP. Shortly after returning from Germany, he reunited with the love of his life, Doris Bohlman, they were married on April 8, 1946 in San Francisco. Soon thereafter they were both discharged from the army and came back to Roundup where Alfred held several ranching positions. When in 1953 Alfred became manager and Doris bookkeeper of the Farmers Union Oil company until their retirement in 1981. They raised their three children, Linda Gayle, Darrel Lee and Gloria Fay. Alfred bred, raised and sold paint horses, with his son Darrel, on his ranch east of Roundup. 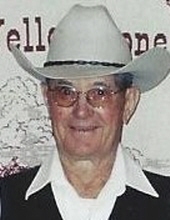 Alfred was a founding member of the Roundup Ridge Riders, serving as president many times. His love of horses and the western lifestyle provided Alfred the opportunity to help organize the “Great Montana Centennial Cattle Drive”. He served as one of the directors; as well as a drover, making his participation in the cattle drive one of the greatest highlights of his life. In January 1993 Alfred and Doris accompanied other cattle drive directors to Washington D.C. to ride as outrider for the Montana Centennial trolly in the Inauguration Parade. Another highlight in his life, was the honor flight for WWII veterans, to Washington D.C. to see the WWII Memorial. One of his last honors was being inducted into the Montana Cowboy Hall of fame in 2015. Alfred is survived by his daughter Gloria (Harry) Kerr of Bowman, North Dakota; Brothers Don (Ann) Adolph, Eddie (Dodo) Adolph, and sister Dorothy Trygg. Grandchildren Shawn Kerr, Teri (Cole) Elhers, Amos Adolph, Andrew (Pamela) Adolph, Josh Adolph; eight great grandchildren and one great great grandchild. He is also survived by, Brother-in-law Edwin (Jean) Bohlman and sister-in-law Shirley Farnum and many nieces and nephews. Alfred was preceded in death by his parents, loving wife Doris, daughter Linda, son, Darrel, grandsons Jimmie Laurie and Jesse Adolph; sister Gardie Steffensrud, and brother Bernard. The Adolph family would like to offer special thanks to Sylvia Crutsinger for her kindness and continued care of Alfred. Services for Alfred will be held Tuesday, Jan. 15 at St. Benedict’s Catholic Church at 11:00 a.m. with Emmanuel Baptist Pastor, Jason Oaks, in charge. Burial will follow at Roundup Cemetery with military honors. In lieu of flowers donations may be made to the Alfred Adolph Memorial fund. Make checks payable to Emmanuel Baptist Church, 602 Main St. Roundup, MT. 59072. To plant a tree in memory of Alfred John Adolph, please visit our Tribute Store. "Email Address" would like to share the life celebration of Alfred John Adolph. Click on the "link" to go to share a favorite memory or leave a condolence message for the family.